British extreme legends Carcass have posted their third track-by-track trailer for their new album Surgical Steel. 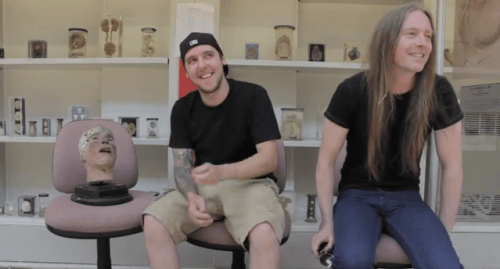 Watch guitarist Bill Steer and drummer Dan Wilding explain the songwriting process for Unfit For Human Consumption, 316L Grade Surgical Steel, Captive Bolt Pistol and Mount Of Execution down below. Surgical Steel is set for release next week on 16th September in the UK and 17th September in North America and later this week in the rest of Europe on 13th September. This entry was posted on 11th September 2013 at 1:06 pm and is filed under News with tags Bill Steer, Captive Bolt Pistol, Carcass, Dan Wilding, Nuclear Blast. You can follow any responses to this entry through the RSS 2.0 feed. You can leave a response, or trackback from your own site.